John Kerr began his musical training in his hometown of Omagh, Co.Tyrone with Simon and has since gone on to study at the Royal Irish Academy of Music initially with Professor James Cavanagh and currently with Colm Byrne and David Collins. John is an avid orchestral musician and has been principal trumpet of the RIAM Philharmonia and Fishamble Sinfonia. He has also appeared with the RTÉ National Symphony orchestra as part of its mentoring scheme (2018) and with the Aurora Symphony Orchestra (Sweden). He was previously a member of both the National Youth Orchestra of Ireland and Ulster Youth Orchestra. John has also participated in numerous masterclasses with renowned teachers and soloists including, Håkan Hardenberger, Reinhold Friedrich, Kristian Steenstrup, Philip Cobb and Mark O’Keeffe. 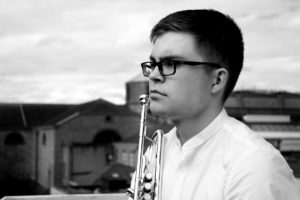 John was a finalist in the 2017 RDS Music Bursary and was the winner of the 2017 ESB Feis Ceoil Senior Brass recital. He performed as a soloist in the NCH, Dublin as part of the 2017 of ESB Feis Ceoil Gala concert and was also invited to take part in the 2017 Camerata Ireland Academy at the Clandeboye Festival in Bangor, Northern Ireland.